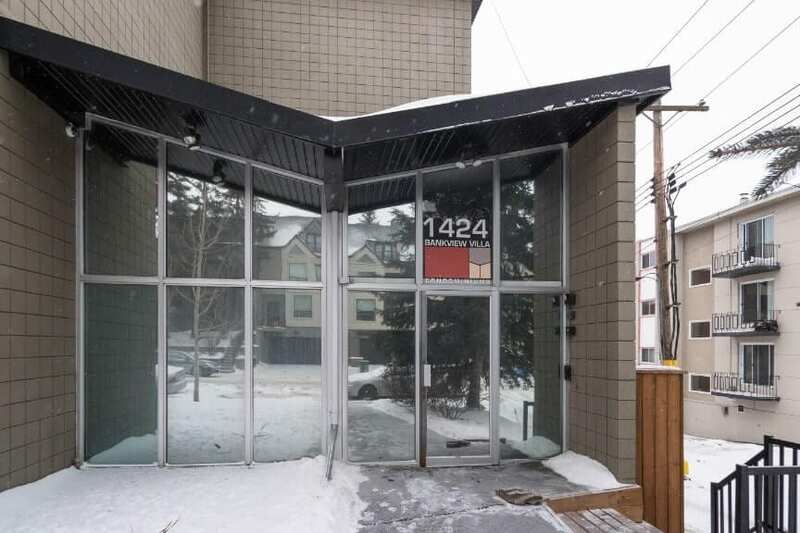 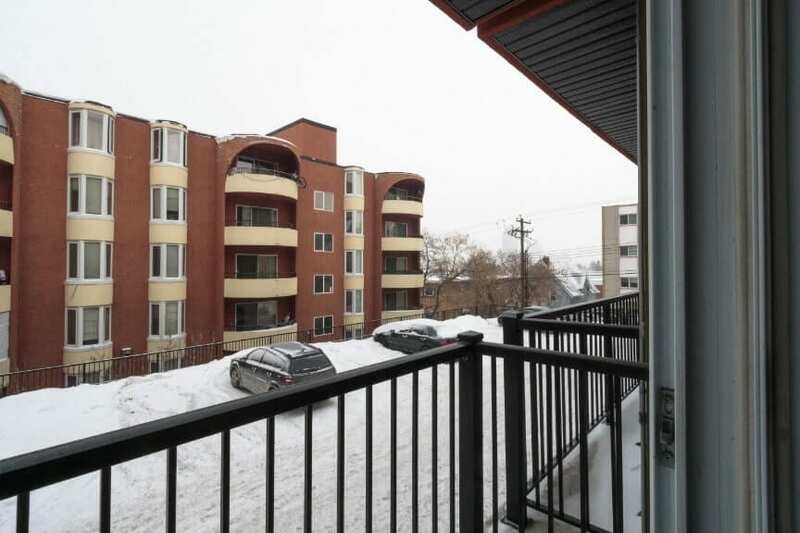 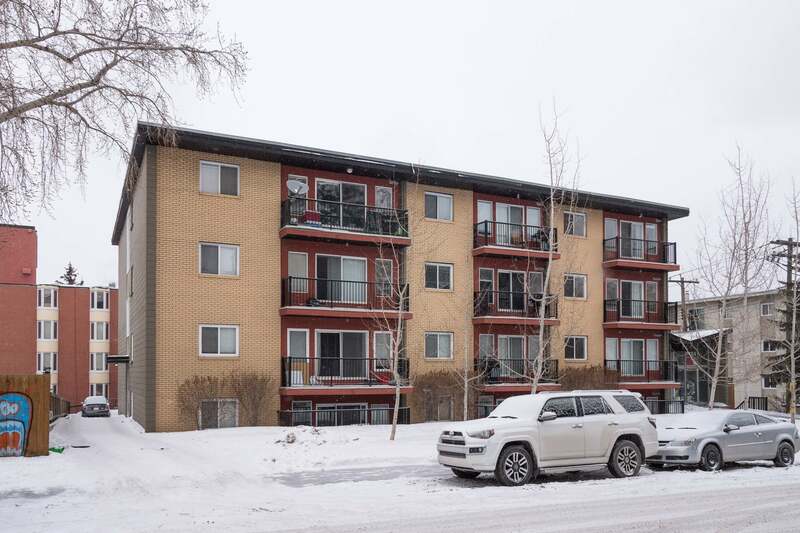 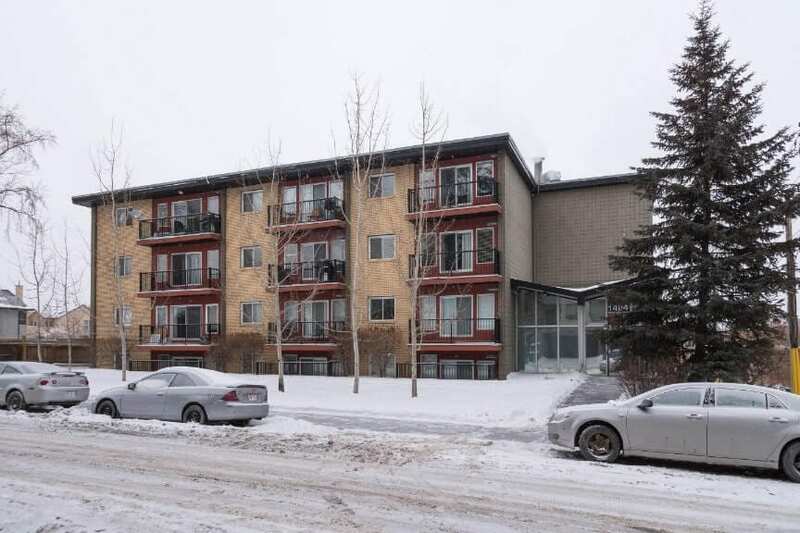 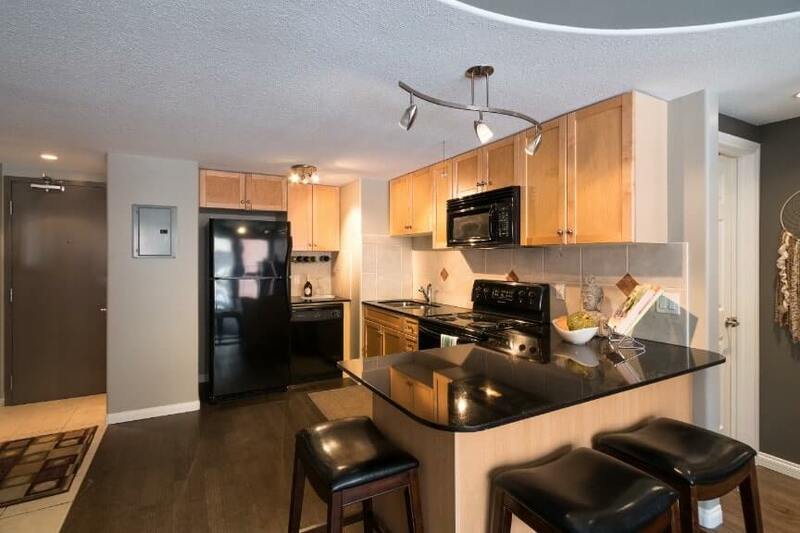 In the beautiful community of Bankview is a small but mighty apartment a quick walk from 17th avenue SW with a view of Downtown Calgary. 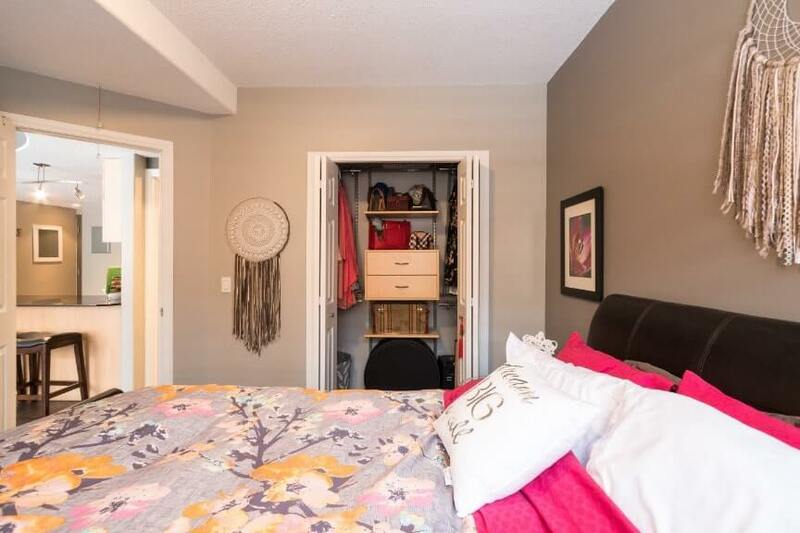 At 580 SqFT, every inch of space in this cozy apartment is carefully and thoughtfully planned out with an open concept for the generously sized kitchen and bright living space, a spacious open bathroom that features an in-unit washer & dryer, and a spacious bedroom with a custom closet. 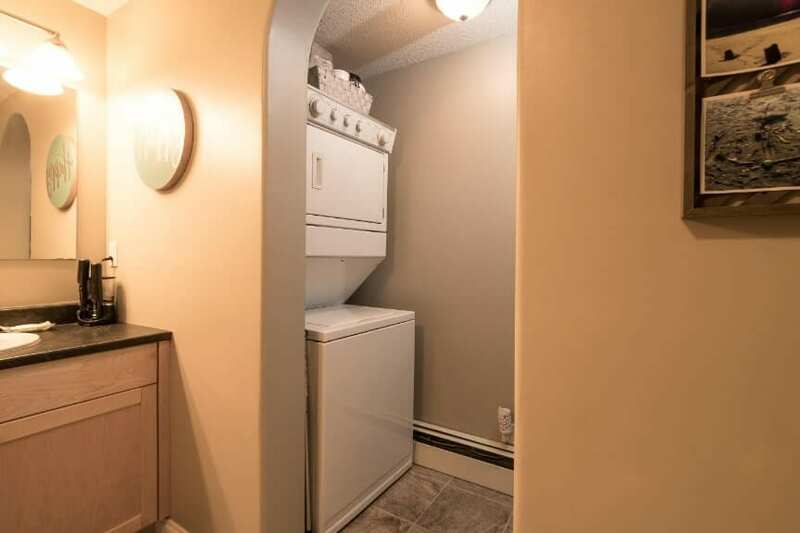 With renovations completed less than 2 years ago, this listing is updated to feel like new with freshly painted walls, ceilings, doors, baseboards, and window panes, new brushed birchwood flooring in the main areas, Egyptian floor tile in the bathroom and new plush carpeting in the bedroom. 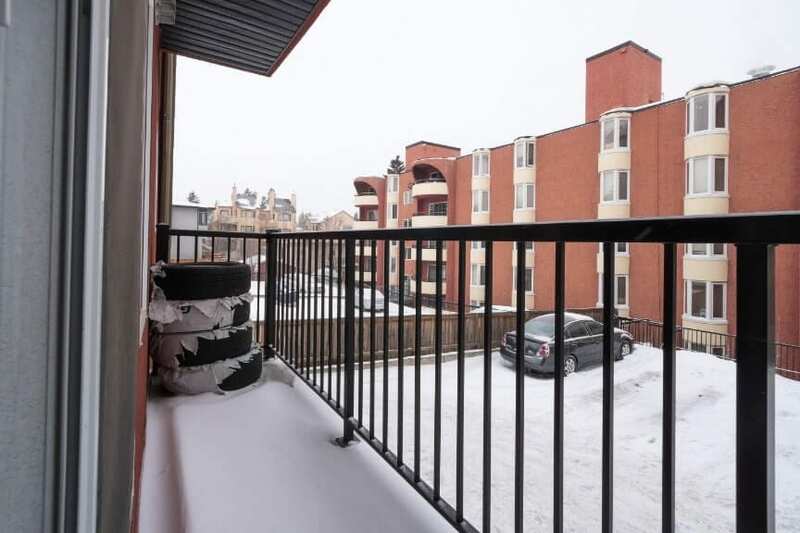 Enjoy assigned parking at this fantastic apartment complex and never have to worry about fighting for parking in the cold! 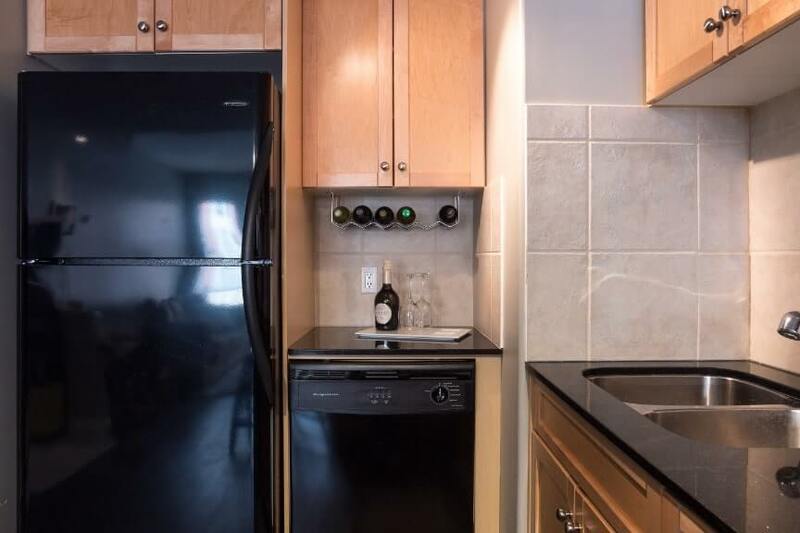 Walking into this bright, open space, you are greeted with a large kitchen with tons of counter space, including a large island, all completed with dark granite countertops that feature dual sinks. 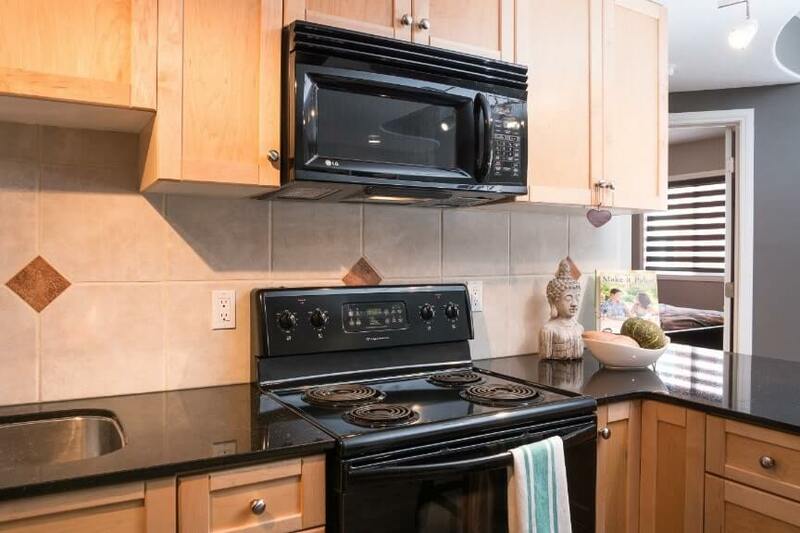 The matching black appliances and gorgeous maple cabinetry make the kitchen a focal point for this bright, open home. 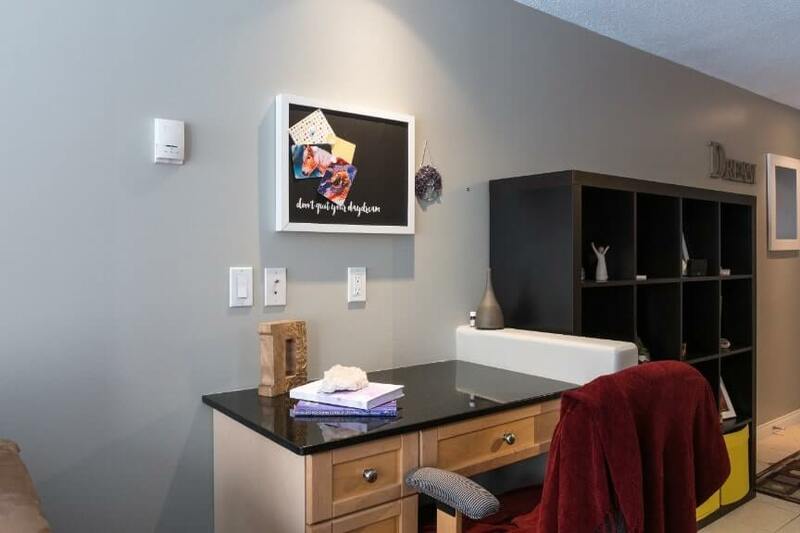 A built-in desk attached to the adjacent wall to the kitchen with a matching black top provides a seamless transition between the living and dining areas, and a great spot for working or studying with an outlet conveniently placed for your electronic needs. 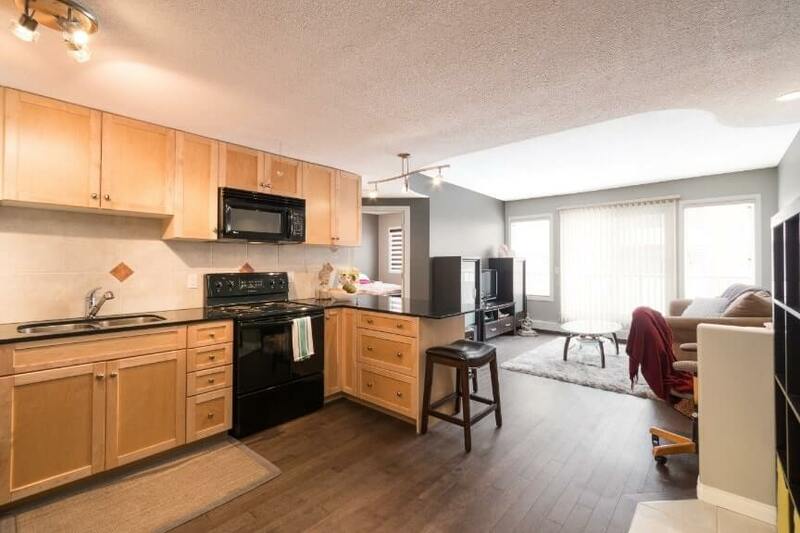 Moving into the living room, a large patio door and window make this space a great source of natural light in the home. 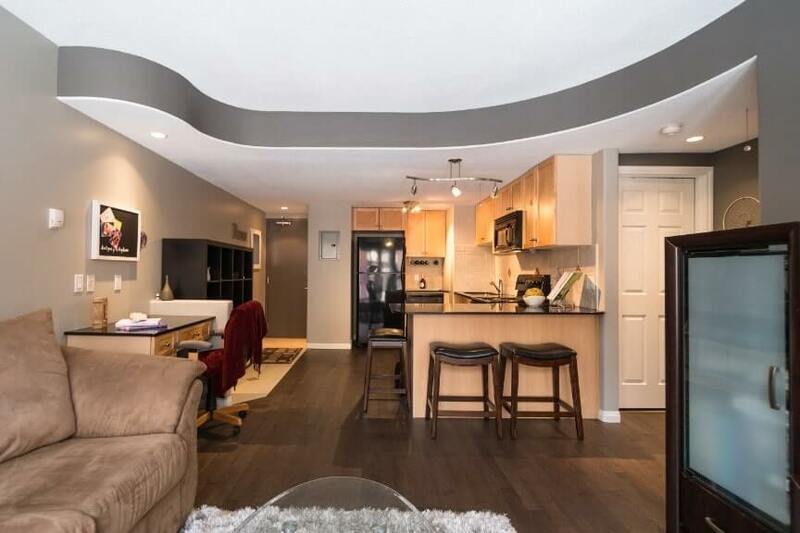 You will turn around to see a raised ceiling with a curved edged, giving a sophisticated touch to the space. 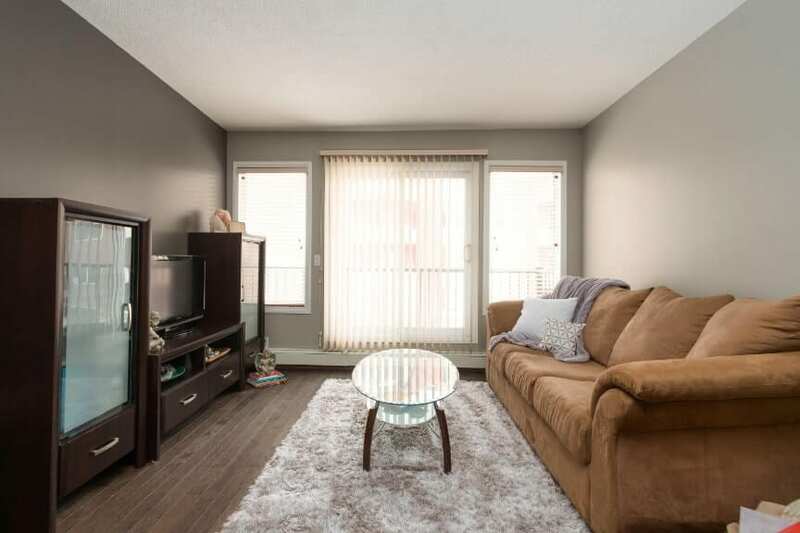 Brushed birchwood flooring throughout the main areas, a convenient layout, and tons of wall space gives you tons of room to work with to make this cozy living room feel like home. 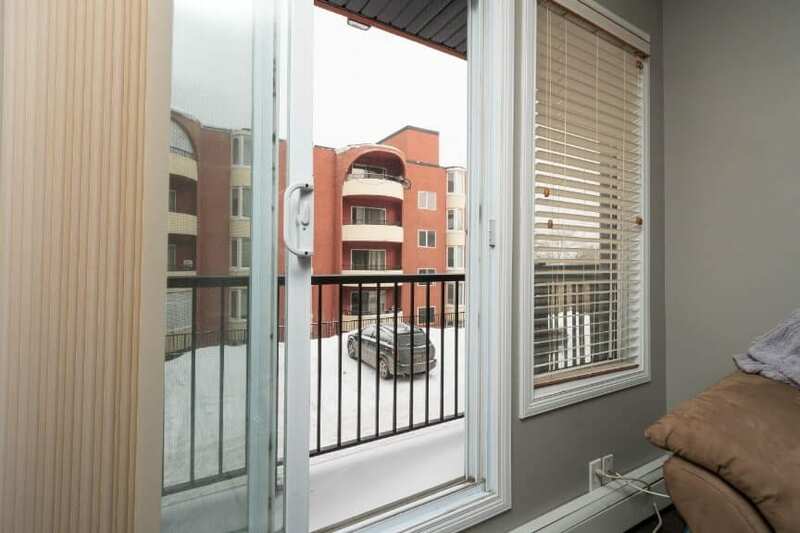 A balcony off of the living room is large enough to fit a chair for lounging and taking in the city views around you in your North facing corner unit. 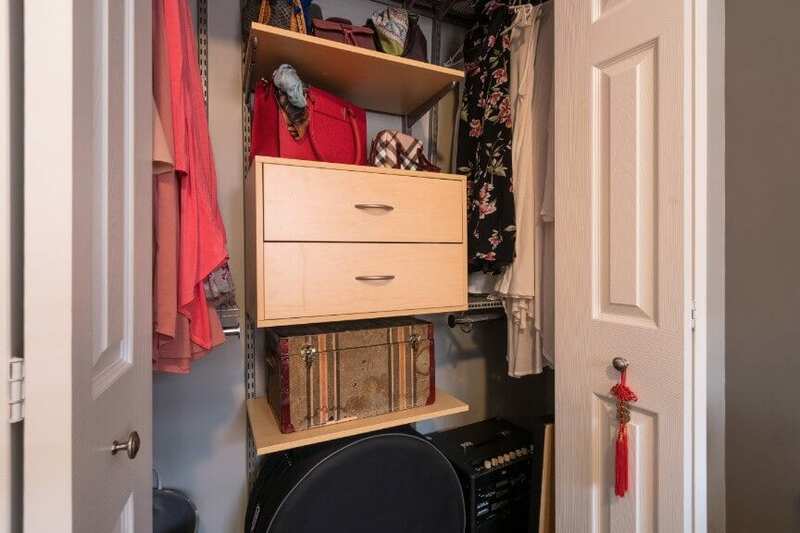 Around the corner you will find your spacious bedroom with room to fit a king-sized bed, with plush new carpeting, freshly painted walls, and a custom closet that makes use of every inch of space. 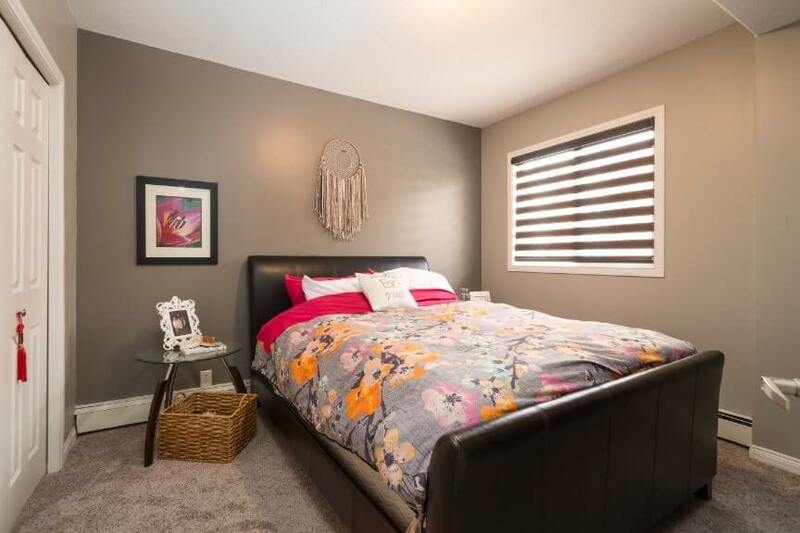 Having a window in your bedroom on the wall adjacent to the closet (with pull down blinds) makes waking up easier to up to a sunny Calgary morning. 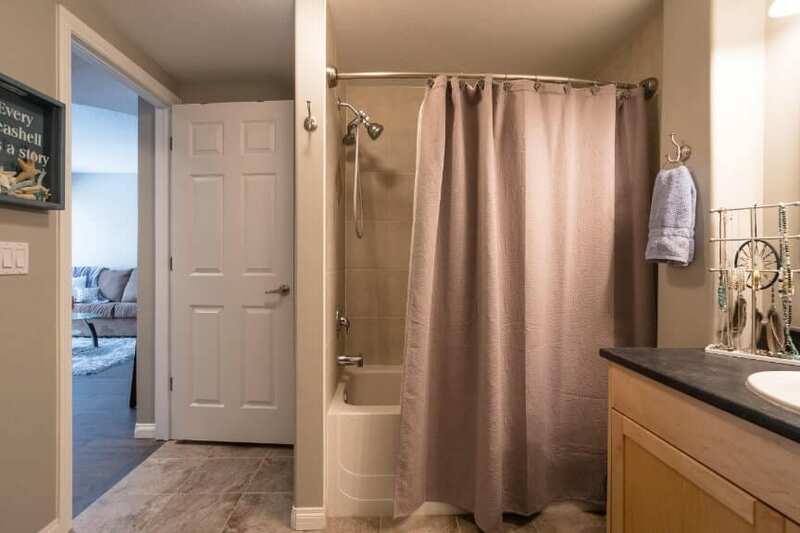 Next to the bedroom is the spacious bathroom with a tub & shower with matching stainless steel shower head with a hand-held feature, tap, and curtain rod, Egyptian floor tile, incredible lighting, usable counter space, and an in-unit washer & dryer! 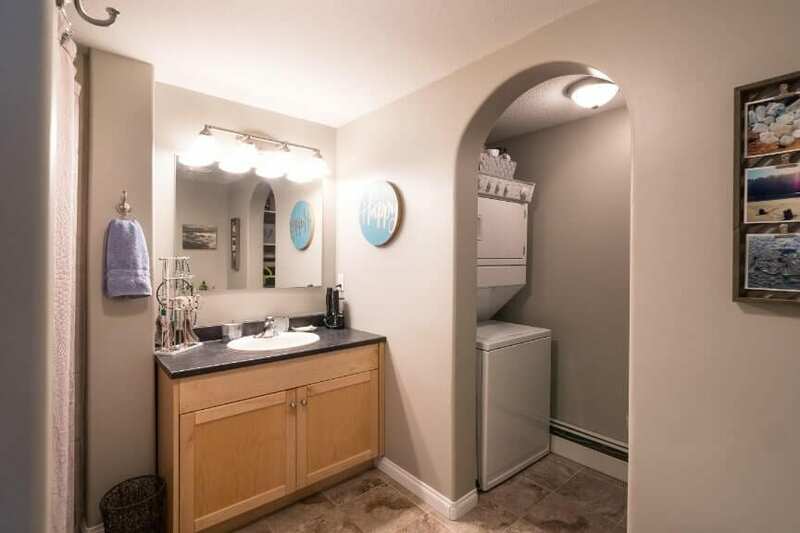 This bathroom is very well finished with light colours making it look fresh and clean and a rounded archway that separates the washer & dryer area and giving a sleek and sophisticated look. 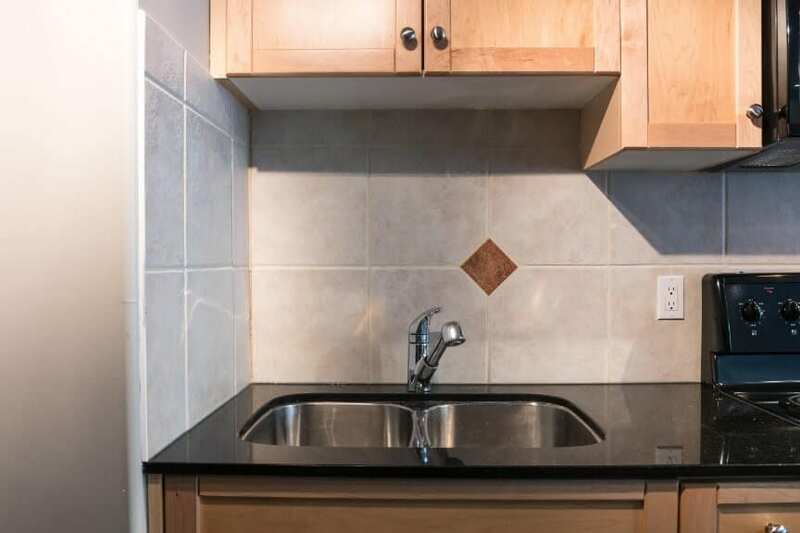 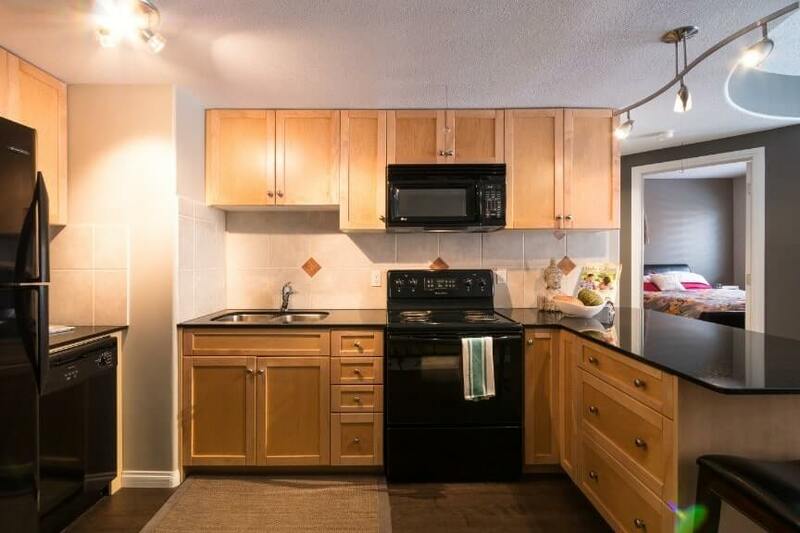 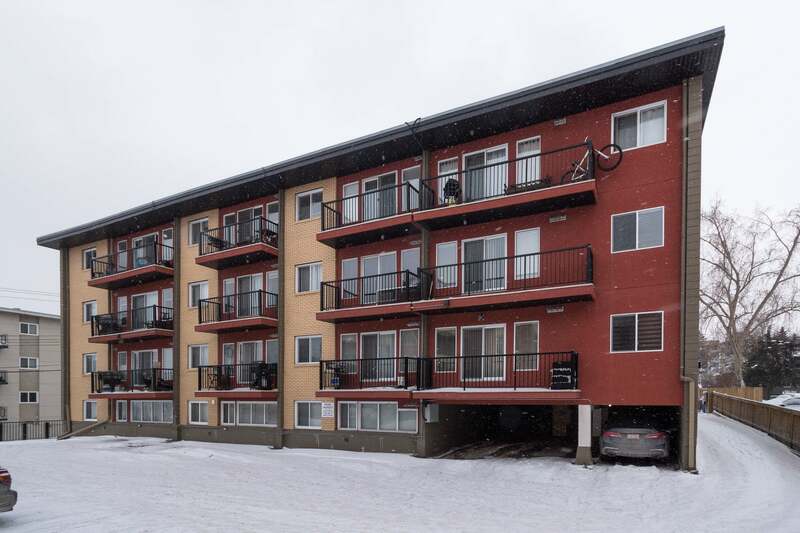 The apartment complex is easily accessible in the beautiful SW community of Bankview. 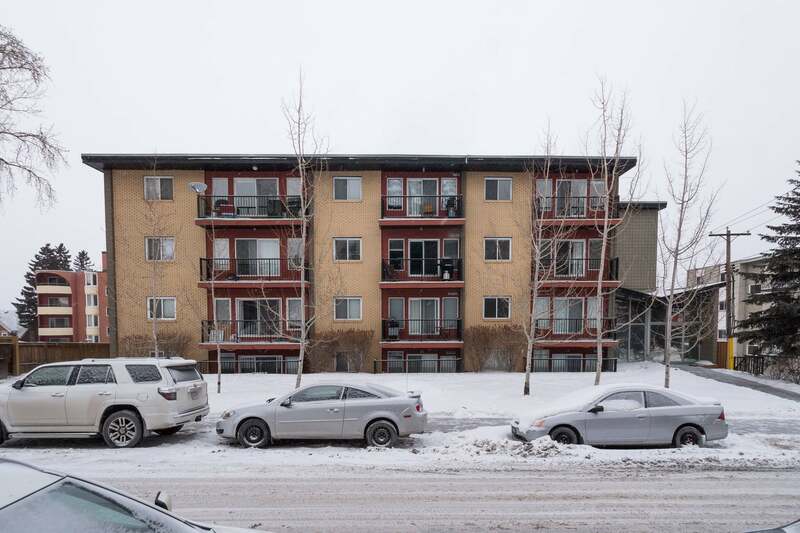 Being less than 10 minutes from the nearest grocery store, less than 15 minutes to the city’s core, 15 minutes from Mount Royal University, and 5 minutes from the action-packed 17th Avenue SW, it is situated perfectly for you whether you are working or going to school in Calgary.